I remember the first advice I gave to my little brother, the first times my female cousins had asked my advice on choosing an outfit for a night out. Thinking back to these times, they all knew that I was passionate about fashion and it is thanks to their support that I embraced this passion, enriched and developed it. Outside my family, my skills extended to a larger circle of friends and of colleagues when I started working for a magazine and then for a major branding agency. Every day I was able to interact with beauty and aesthetics, organise events and advise clients. During all these years, I have also realised that I wanted to go further, that all this was not just a hobby but really something that inspired me. And also, that beyond a love for shopping and the pleasure of matching up outfits, fashion is a real science to be learnt and maintained if you want to make a profession out of it. So yes, my train was soon to arrive in Paris and I would soon be able to admire the beautiful Parisiennes in the streets and gain inspiration from this oh-so elegant city that has always fascinated me. But my purpose on this trip was quite something else: I was to meet Cristina Cordula, attend her workshop for two days, listen to her advice, go a step further in making my dream project a reality and give a logical continuation to all that had come before. In life there are people who leave us indifferent, others we would want with us always and others we want to forget as quickly as possible. And then there are people who inspire us. You know, those that bring a smile to your lips, who push you to make your dreams come true and who make you say to yourself “this is me, this is who I want to be”. Cristina is a little of all that for me. 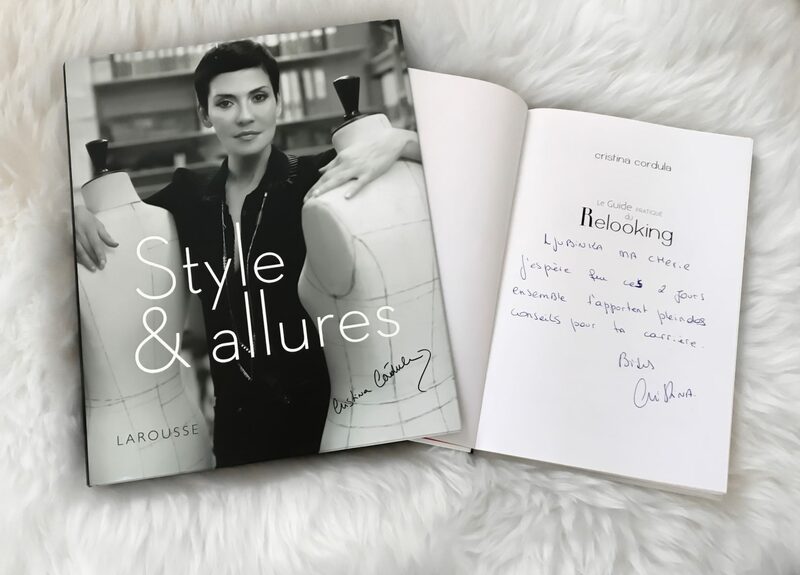 For years I have been following her TV programmes and laughing at her little mimics, I admire her natural and light-hearted way of talking about style, her irresistible accent and genuine elegance. So obviously, meeting her for real… well, I think you get it!! When I started studying personal branding seriously, I learnt a lot of rules, things-to-do, things-not-to-do, etc. That’s all very well, but for me fashion has another dimension – a more fun dimension focused on trends, more people-oriented too, happier. Well I’d come to the right place, Cristina Cordula’s smile was the first thing you notice. In truth, she never stops smiling. In Paris, she welcomed me with a smile on her lips, as if I was her best friend. Formality doesn’t exist in her world. But that doesn’t mean she’s superficial or fake, just a lovely impression of being where she should be, sharing a moment together, both simple and inspiring. But back to reality. Totally unravelled and energised by this event, I was finally going to be able to breathe some life into my project. After all, that’s what gaining inspiration is all about.